I knew that training for the Tough Mudder race would be different than any kind of training I’d done before. What I’ve found when it comes to doing any type of exercise: find what appeals to you. To keep my enthusiasm up and keep me going back for more I have to look forward to my workouts. For this event I’ve designed a training plan for myself that doesn’t feel like work and everything has just clicked. Not to say it’s easy. My muscles quiver after almost every workout, but I can’t wait until the next one. I feel stronger, more aligned and have more energy than ever before. Muscular strength is going to be key in successfully completing the Tough Mudder. Problem: I absolutely hate lifting weights. It always feels awkward and tedious to me. Solution: Pilates. Pilates workouts are lengthening and strengthening all of my muscles and I have a stronger core than I’ve ever had in my life. This will help me to get across the monkey bars obstacle (easy when you’re 7 years old…not so easy as an adult!). Lisa and Lindsay are the very effective taskmasters at Engage Your Core in Newburyport, MA. where I’ve been training. My schedule includes a Reformer class once a week on a machine that looks vaguely like a torture device. The first time I tried the Reformer I became instantly addicted. The 50 minute workout flies by. I add in 2 or 3 mat classes every week as well. When I’m traveling or can’t get to a Pilates class I supplement with workout DVD’s; specifically barre/bar workouts. These are based on traditional ballet exercises and are deceptively simple. Between these two workouts I’m feeling achy where I never even knew I had muscles. For the cardio portion of my training any type of aerobic activity will do as long as it gets my heart rate up and I work up a sweat. My activity of choice is running. Living in New England this winter has been a challenge for outdoor running so I’ve been supplementing the running with indoor Nordic Track training as well as the occasional snowshoe excursion. 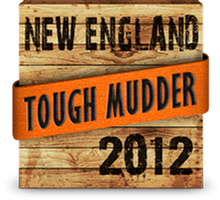 The running I’ll need to do for the Tough Mudder race is different from my usual long-distance running. Sure, it’s 10 miles total, but it’s broken up by 22 obstacles. Run for a while, jump into an icy pond. Run for a while, climb an ice wall. Run for a while, crawl through the mud under a barbed wire canopy. You get the picture. Specifically, my training plan consists of 30-45 minutes of cardiovascular exercise 3 or 4 times a week. I’m currently doing runs of between 3 and 4 miles and will increase that to around 8 miles in the remaining 2 months before the race. This is the most elusive component of the three. 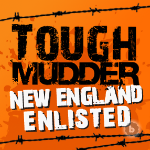 For a race like the Tough Mudder it’s crucial, but it’s just not something you can train for. For the times when your body is telling you it just can’t do any more or go any further this resolve is what you need to keep moving. Luckily I’ll have my teammates going through this with me, so at any given time while some of us are losing steam the others will be pumped up. Here are some techniques I’ve used in the past to get me through a rough patch in an event. 1) Focus on the here and now; don’t think too much about what’s coming up next. 2) Break it down into smaller segments. Thinking “I only need to do this for 2 more minutes then I can move on” keeps whatever it is from seeming unmanageable. 3) Anticipate the sense of accomplishment you’ll feel when it’s all over and done. 4) When all else fails, think about how great that beer (cupcake, buffalo wings, whatever does it for you) will taste at the end.